The Pedestrian Memorial Project was established to honor pedestrians killed on New York City streets. An outgrowth of the Ghost Bike movement, a plaque is placed at the site of a pedestrian fatality, indicating that the all too common tragedy occurred there. Killed here by motor vehicle. Save Lives: Drive safely and respect each other. We seek to cultivate a compassionate and supportive community for survivors and friends of those lost and to initiate a change in culture that fosters mutual respect among all people who share the streets. 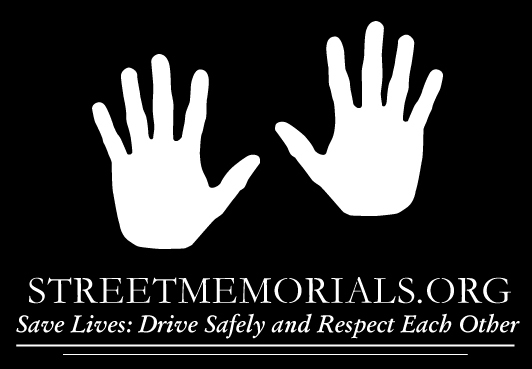 Our memorial plaques serve as a reminder of the severity and extent of the problem of unsafe streets in New York City. The Street Memorial Project will install hundreds of memorial plaques for pedestrians throughout New York's five boroughs. It is our hope that this project will gradually evolve, so that families, friends, and local community groups, such as senior centers and neighborhood associations, can install these plaques with our support.